Upmav is a healthy and delicious breakfast recipe and is very popular in south India. It is also one of the easy to prepare breakfast item. 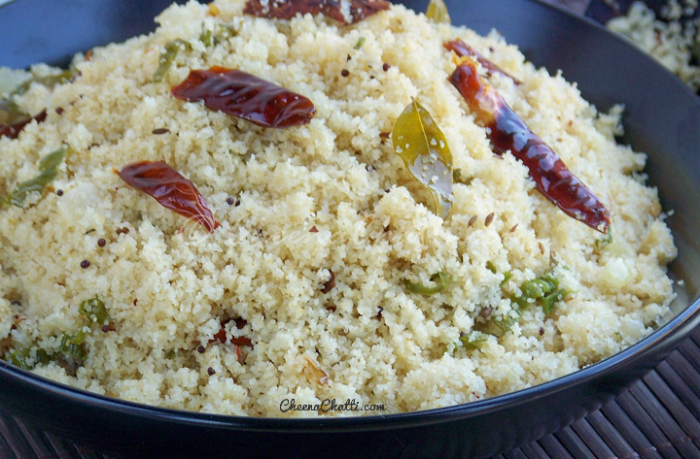 It does not take much time and upma preparation can be done in 15-20 minutes, if you have the roasted semolina ready. With the following upma recipe, you can create tasty and healthy upmav. Try it and let me know your comments. In a pan, heat ghee or oil. Add mustard seeds and when they starts crackling, add the cumin along with urad & chana dal. Fry till they become a little brown. Add the green chilly, curry leaves and ginger and fry them for a minute. Add water to this mixture and let it come to a boil. Add salt and when the water becomes boiling, lower the flame and add semolina to it*. You can add more water if the mixture looks dry. Lower the flame and simmer the upma for 2-3 minutes. Remember to keep stirring at each step so that the upma does not stick to the pan. Garnish with vegetables / coriander/cilantro leaves. When you add semolina (Step 8), keep on stirring. Also semolina should be added in small amounts with a spoon with constant stirring to avoid lump formation (in the above video this step is different – since the video is from another chef found in the internet). You can add some lemon juice to give a different flavor to the upma. Keep the roasted semolina in an air-tight container. This way the semolina stays well for a longer time and does not become mouldy or spoilt. This entry was added on February 21st, 2013 by Reeja MytheenKunju in Videos and tagged with breakfast, easy upma recipe, how to make upma, south indian upma. kerala breakfast recipe, upmav. Last revised on March 27th, 2018. Recipe & Recipe photo contributed by Seethalakshmi N.
Any idea how the upma can be made in a way that resembles the picture shown in this recipe – flaky and resembling crumbs? @Mrs Sheikh : Dont use too much water and add the roasted semolina, a little at a time, stirring constantly to prevent any lumps from forming. Thanks for the reply Reeja. I’ve done that in fact have reduced water all the way to a 1:1 water-semolina ratio and still have never achieved the all-crumby texture. I’ll try adding the semolina a little at a time and see how that goes. @Mrs Sheikh : This is how we prepare it and we usually gets a crispy nature. Try to reduce the amount of water. one f ma fav ! How interesting! I just rileased that we mainly use semolina for sweet dishes and I’ve never seen it as an ingredient in savoury dish. Looks similar to veggie coucous and really delish!Thanks for sending it my way Happy New Year to you and your family! Thanks a lot for bringing it into our attention @VishnuPriya A S.
You are right that, both of the recipes seems same. Can be because of the ubiquity of upma or may be because both of us followed the same source or used the same method. Since similar contents can affect PR of both sites, we have made necessary modifications to the post. Thank you Abhi. Feel free to try other recipes too and drop your comments.